The interiors of your home reflect your style and what you choose to showcase in your hall tells a lot about your personality. Travel junkies often have their homes peppered with souvenirs of their travels, all arranged in an easy-going style. Those who are perfectionists often have homes that kept as neat as a pin – not a cushion is out of place in these well-maintained homes. Everyone has their own style of furnishing and decorating a home. The interiors might have a common theme, a color, or a pattern that weaves them together. Whatever the case may be, there are some items of furniture that are must-haves when it comes to bedroom and living room interiors. Let’s take a look at five such items. A living room is incomplete without a coffee table. It is an essential link that brings together the look and feel of the entire space.The coffee table needs to be proportionate to the size of the room and the rest of the furniture. Too big or too small and you risk turning it into a misfit! A variety of styles and materials come into play with coffee tables, from the classic to the contemporary – so ensure you see a wide variety before finally making your choice. The nightstand is a functional and decorative piece of furniture that should be a staple in every bedroom. You can place a nightstand on either side of the bed or one in between the two beds if it is a guest bedroom or one used by children.It’s a great place to keep that book as you nod off or to store your phone or a drink of water every night. Clever minimalist pieces are ideal for small bedrooms – choose the one that suits your style best. An ottoman can jazz up your bedroom interiors or complement your living room furniture thanks to its versatile design. An ottoman can double up as a seat or a footrest and if it comes to storage options then there’s nothing like it! Ottomans can be tufted, made of fabric or leather. A great spot for a power nap on sultry afternoons or a place to curl up with a book on cold nights, the chaise lounge is a must-have for a large bedroom. Choose one that goes with the bedroom interiors and is comfortable too. 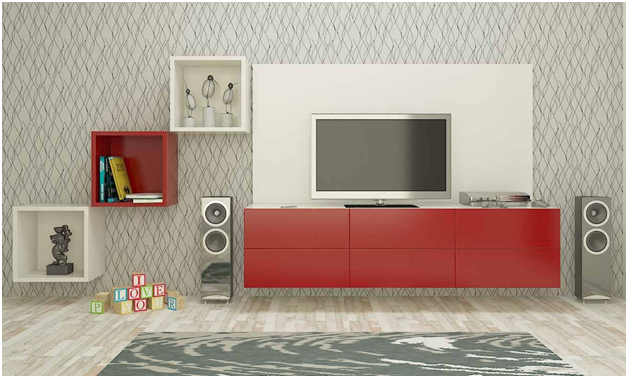 Get a multi-purpose cabinet for the living room, preferably one with glass doors to keep the dust away. You can use it to showcase your knickknacks, souvenirs or your favorite books. Handpick each item of furniture with care and put a lot of thought about how you will utilize it before making your purchase. Your furniture reflects your style and hence, the importance of choosing your furniture with care and deliberation. In this way, even essential pieces assume a whole new meaning altogether. If you’re the type who likes to re-vamp your interiors every now and then, choose lightweight furniture and those that are easily exchanged.